Centella’ s active ingredient, Centella Asiatica is medically tested and proven in the treatment of wound healing, venus insufficiency and reduction of scarring, helping to unclogged pores, anti-bacterial and acne-affected skin. The formula promotes healing and stimulates collagen production. Ingredients include the softening and firming. Centella Asiatica extract, which helps to improve circulation and stimulating the lymphatic system. Centella increases development of new blood cells and blood veins, increasing blood flow to the area. Centella repairs, heals and increases collagen synthesis. Combination to oily skin types experience an excessive secretion of sebum. However, sebum increases when the epidermis feels ‘attacked’, as sebum serves as natural defence. Therefore, it is vital to use the appropriate skin care for skin type so the skin can find the correct balance. Is a protective sheath responsible for a myriad of functions. It also keeps us looking youthful by continually producing ‘plumping’ or ‘youth’ factors like collagen and elastin fibres that form the foundation of the deep dermal layer of the skin. As we age, collagen and elastin production slows down and skin starts showing the cardinal signs of ageing. Combine this physiological ageing process with harsh environmental insults and one is left with wrinkled, sagging, mottled skin with various degrees of skin malignancies, broken facial blood vessels and dry dull skin. The Centella™ Anti-Ageing line of plant based products is specifically designed to combat factors that are responsible in the pathogenesis of ageing. It’s a results-driven, clinically efficacious line that says what is does. Worldwide clinical studies indicate that extracts of Centella Asiatica (known as the age reversal plant) resulted in stimulation of fibroblast proliferation, collagen synthesis, strengthening of blood vessels, a dramatic increase of beneficial enzymes and a reduction of inflammation, along with a reduced chance of developing skin malignancies. In essence, your skin truly heals from within when you use the Centella™ Anti-Ageing line. End result- healthy rejuvenated skin that translates visibly into radiant youthful skin. 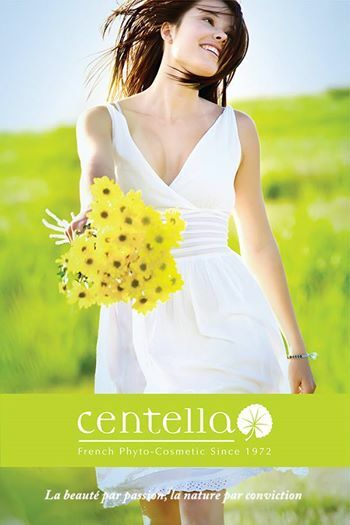 Welcome to the Centella™ difference. Designed for sensitive, dermatitis, rosacea, psoriasis and delicate skin. Our nurturing treatments helps to put back the balance to a reactive skin. Containing vitamin A, C, K and B coupled with omega 3 and 6 we are able to help soothe and strengthen skin, preventing and helping redness, broken capillaries, giving you a plumper, hydrated and repaired skin. Results are immediate and spectacular. It accelerates cellular regeneration and gives a youthful, radiant appearance, helping to restore and hydrate the epidermis. It delivers excellent healing effects, balances collagen production, restores vein walls and elasticity. The Hydraflore Paris skin and body range is a Medical Grade Certified Organic and is specifically formulated for expectant mothers and people with sensitive skin. It contains no allergenic essential oils which are extremely harmful to unborn babies. All of the products in this range contain Wild Rose Oil which is renowned for its regenerative and restoring properties-ideal for fighting signs of ageing, soothing and healing stretched or damaged skin. Stem cells are cells from which life is born. They are a part of all living things; plants, animals and humans, although plant stem cells present the greatest benefits. When it comes to skin rejuvenation, plant stem cells possess versatile and restorative properties; one single cell is enough to regenerate an entire plant. These properties are what make stem cells so valuable and widely used in many fields, including in the cosmetic and beauty industries for tissue repairand skin rejuvenation. Stem cells have the capacity to periodically repair tissue when dead cells stop working, thus regenerating damaged tissue and restoring human skin to a more youthful state. What causes fat and cellulite? Fat, also known as adipose tissue is comprised of cells made of lipid molecules. Much like other cells within the complex physiology of the body, there is much diversity amongst fat cells based upon the location and function of the individual cells within the body. Subcutaneous fat, or fat which settles under the dermal layers is often attributed to problem areas and excess weight. When there is an abundance of subcutaneous adipose cells under the skin, there are often areas of uneven protrusion and texture causing what many have come to know as the “orange peel” appearance of cellulite. Cellulite can be caused by several different factors, many of which are beyond control: metabolic changes, physiological changes, stress, skin structure, genetics, hormonal imbalances and changes within the body. These factors, coupled with intrinsic ageing can exacerbate the appearance of trouble spots, sagging skin, loss of elasticity, and cellulite. What is Centella Slimming? Clinically tested botanical extracts come together to provide a total body solution to help rid of the body of fat accumulation, cellulite, varicose veins, stretch marks and sagging skin while encouraging full body firming, toning and cellular rejuvenation.